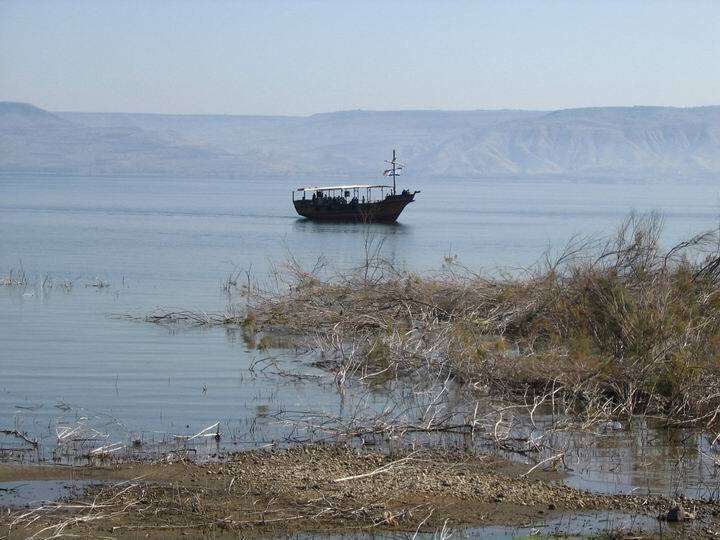 A 1st century AD fishing boat was found on the shore of the sea of Galilee, which may be from Jesus times, or the Jewish revolt. It is displayed in a museum in Kibbutz Ginnosar. This Roman boat was discovered by accident in the winter of 1986, after a dry season when the lake was very low. It was found on the muddy shores of the sea of Galilee between Ginnosar and Magdala. After 12 days of excavations on site it was transferred, and now exhibited in a special museum. 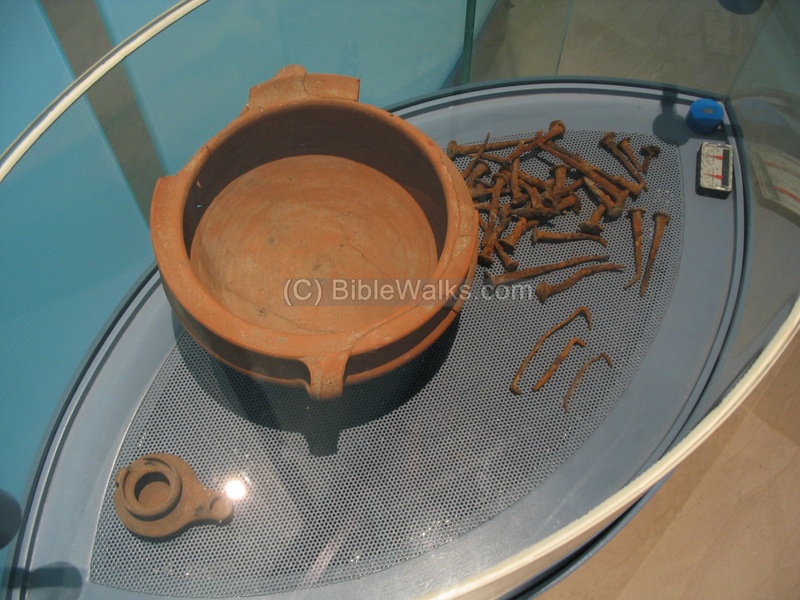 The museum that exhibits the "boat of Jesus" is in the Yigal Allon center in Kibbutz Ginnosar. You can stop here on the way from Tiberias to Capernaum, for an half hour. 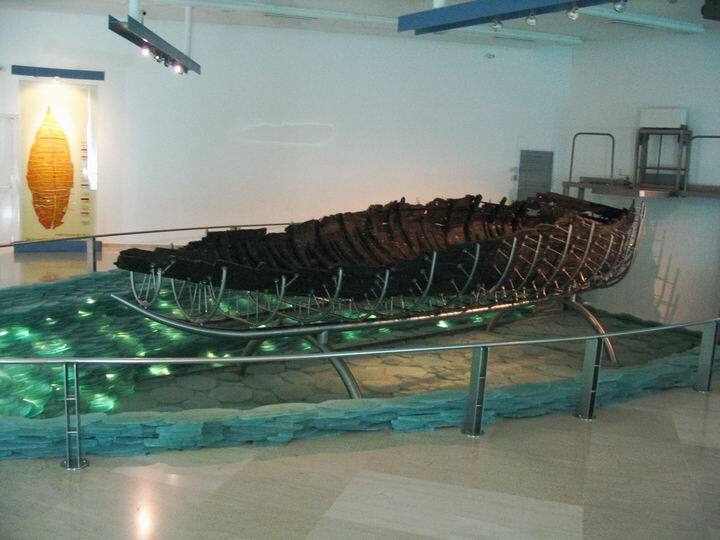 The restored boat is displayed in a special museum in Kibbutz Ginnosar, north of Magdala. The boat is 9M long, 2.5M wide, 1.25M high. It is made of 14 different types of wood, as seen in the chart behind the boat. It may have functioned as a ferry, reused as a military ship (such as described in the battle of Magdala), or used by the fishermen. The boat was dated to the 1st century AD, the times of Jesus and the Jewish Revolt against the Romans. To date the boat, Carbon 14 tests were made. Additional dating information came from the artifacts that were found in the boat (shown below): cooking pot, arrow head, nails, hooks and oil lamp. A boat sailing near the museum brings the story of the boat back to life. 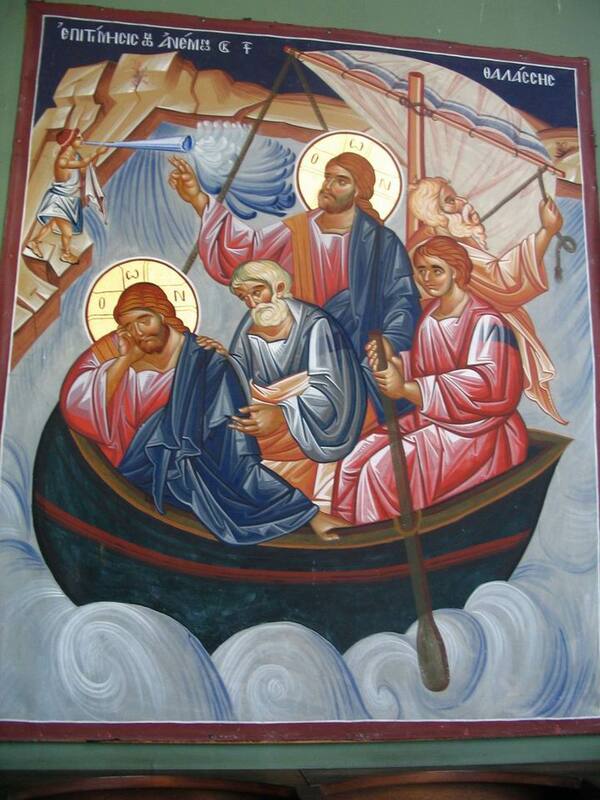 There are several references to the sailing of Jesus in the sea of Galilee. Was this one of the boats? When Jesus heard of it, he departed thence by ship into a desert place apart. The miracle of the storm, which happened in the Sea nearby, is described by Mathew (appears also in: Mark 4:35-41 , Luke 8:22-25). "And when he was entered into a ship, his disciples followed him. And, behold, there arose a great tempest in the sea, insomuch that the ship was covered with the waves: but he was asleep. And his disciples came to him, and awoke him, saying, Lord, save us: we perish".
" And the same day, when the even was come, he saith unto them, Let us pass over unto the other side. And when they had sent away the multitude, they took him even as he was in the ship. And there were also with him other little ships"
Which, when it was full, they drew to shore, and sat down, and gathered the good into vessels, but cast the bad away". Josephus, the Commander of the Jewish revolt against the Romans, and later a historian of the period. He writes that he fortified the city of Tarichess (or, Magdala). Later he describes the bloody war in Magdala, the slaughter of its defenders by Titus and his father Vespesian, in 67AD. After the city was taken, many of its fishermen fled by boats, but the Romans chased them in the lake. 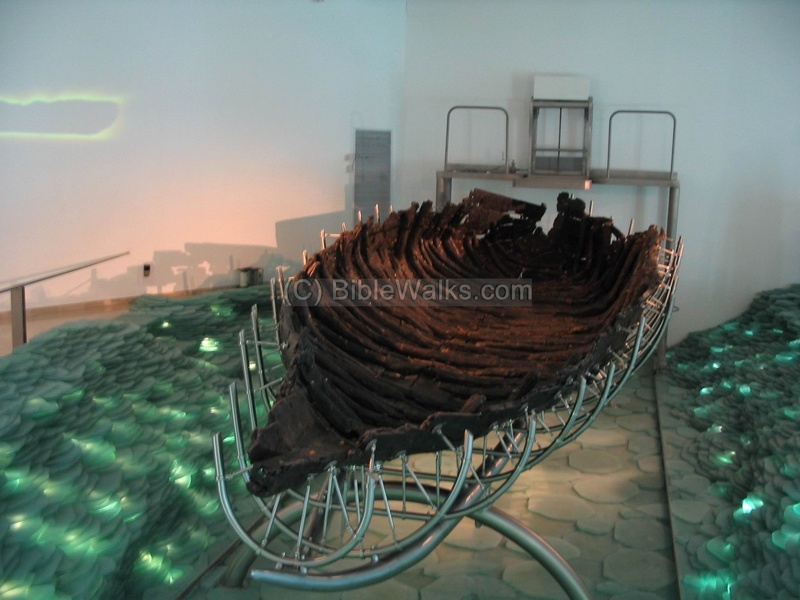 Is the boat one of those that escaped from Magdala, or one of the boats used by the Romans? 6. "Hereupon Titus sent one of his horsemen to his father, and let him know the good news of what he had done; at which, as was natural, he was very joyful, both on account of the courage and glorious actions of his son; for he thought that now the greatest part of the war was over. He then came thither himself, and set men to guard the city, and gave them command to take care that nobody got privately out of it, but to kill such as attempted so to do. And on the next day he went down to the lake, and commanded that vessels should be fitted up, in order to pursue those that had escaped in the ships. These vessels were quickly gotten ready accordingly, because there was great plenty of materials, and a great number of artificers also. 9. But now, when the vessels were gotten ready, Vespasian put upon ship-board as many of his forces as he thought sufficient to be too hard for those that were upon the lake, and set sail after them. Now these which were driven into the lake could neither fly to the land, where all was in their enemies' hand, and in war against them; nor could they fight upon the level by sea, for their ships were small and fitted only for piracy; they were too weak to fight with Vespasian's vessels, and the mariners that were in them were so few, that they were afraid to come near the Romans, who attacked them in great numbers. However, as they sailed round about the vessels, and sometimes as they came near them, they threw stones at the Romans when they were a good way off, or came closer and fought them; yet did they receive the greatest harm themselves in both cases. As for the stones they threw at the Romans, they only made a sound one after another, for they threw them against such as were in their armor, while the Roman darts could reach the Jews themselves; and when they ventured to come near the Romans, they became sufferers themselves before they could do any harm to the ether, and were drowned, they and their ships together. As for those that endeavored to come to an actual fight, the Romans ran many of them through with their long poles. Sometimes the Romans leaped into their ships, with swords in their hands, and slew them; but when some of them met the vessels, the Romans caught them by the middle, and destroyed at once their ships and themselves who were taken in them. And for such as were drowning in the sea, if they lifted their heads up above the water, they were either killed by darts, or caught by the vessels; but if, in the desperate case they were in, they attempted to swim to their enemies, the Romans cut off either their heads or their hands; and indeed they were destroyed after various manners every where, till the rest being put to flight, were forced to get upon the land, while the vessels encompassed them about [on the sea]: but as many of these were repulsed when they were getting ashore, they were killed by the darts upon the lake; and the Romans leaped out of their vessels, and destroyed a great many more upon the land: one might then see the lake all bloody, and full of dead bodies, for not one of them escaped. And a terrible stink, and a very sad sight there was on the following days over that country; for as for the shores, they were full of shipwrecks, and of dead bodies all swelled; and as the dead bodies were inflamed by the sun, and putrefied, they corrupted the air, insomuch that the misery was not only the object of commiseration to the Jews, but to those that hated them, and had been the authors of that misery. This was the upshot of the sea-fight. The number of the slain, including those that were killed in the city before, was six thousand and five hundred. "